A conference call enables you to talk to multiple people all over the world at the same time via telephone. Do I need to book my conference call? No, you do not need to book your conference with us. Who pays for the conference call? The person who has set up the account with us (usually the host of the conference) pays for everyone who joins. The participants do not pay to join the conference. Invoices are sent to the host monthly. How much will my conference call cost? 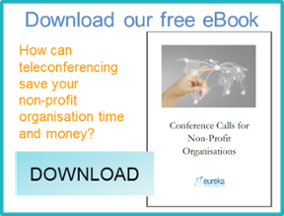 The price of your conference will depend on where your participants are dialling in from. Our basic charge is 8 cents per user per minute (excluding GST). All you have to do is fill out our Register Now form. Once registered, we issue you with a list of dial-in telephone numbers and a unique host and guest access code. Whenever you wish to conference, the host and guests use the dial-in number relevant to their location. Once prompted, everyone enters their respective codes into their phone keypad and all parties are automatically joined to the conference call. What is the Eureka guarantee? We have thousands of happy customers. However, if you are not completely satisfied with the Eureka Conferencing experience, you will not be charged. Do I need to book my teleconference? No. Eureka offer a 24/7 reservationless teleconferencing service, so we don’t need to know when you are conferencing with us. Can different departments in my company hold conferences at the same time? You can add additional conference groups to your account so that multiple conferences can be held at the same time. Separating your conferences by providing staff with individual Host Codes ensures you can track usage and costs more effectively. How many people can I have in the teleconference? Eureka can handle more than 400 callers in any one teleconference. However, if you expect over 100 callers in a conference, please contact our friendly helpdesk and we will tailor your conference setup to maximise your teleconferencing experience. What if I have a large, high profile teleconference? No problem! At Eureka, large conferences are an everyday experience. Let us know when it’s due to take place and we can tailor your conference to suit. For example, we can ensure all guests are on mute when they dial in, we can remove entry and exit announcements and we can allow multiple hosts. We can also add auto-recording or add a managed Q&A session. These settings will ensure your conference runs without interruption and everyone gets a fair chance to speak when required. Your conferencing experience will be greatly enhanced for both you and your guests. What if there is no toll free number for the country I require? The caller can make a long distance call to our platform in Australia - this call cost will appear on the individual caller’s phone bill. Alternatively, the host can connect the guest from within the conference by using Host Dial Out; the host will then incur the cost of the call. Remember, participants in Northern Ireland must use the 'United Kingdom' number, and participants in the Republic of Ireland use the 'Ireland' number. What’s the difference between a capital city number and a national toll free number? Participants calling into a capital city number will be charged the toll from their telephone carrier to reach that number and the host pays for the conference connection. Whereas participants calling the national toll free number from a landline will not incur any charges. The toll charge and the conference connection charge will be incurred by the teleconferencing account holder. Callers from a mobile phone to the toll free number may incur a charge from their mobile carrier depending on their individual plan. What is the best way to plan a teleconference when all the participants are in different time zones? We have found a couple of handy tools to help you schedule meeting times in different time zones. Can I record my conference? You can record your conference for $27. You can manually record each conference or you can set up your account to automatically record all of your conferences. The recording will be available for 28 days for the host to download from our secure servers. They can distribute the recording by email or it can be embedded onto a website. The meeting can also be played back over the phone for 20c/min from a landline and 39c/min from a mobile. There are no time limits on meeting recordings. How do I access my recording? Your conference recording can be downloaded from our website. Simply enter the host access code here and you will see all the recordings made using this code. Each recording is available to download to your desktop or website. Each conference recording has a unique replay code. This replay code will be the code your guests are asked for when dialling the toll free replay service. Click here for more information on recording. Why would I use Host Dial Out? This feature allows you to step out of the teleconference temporarily to invite guests into your conference. You can control the guestlist by dialling them into the conference personally. You can use this service to ensure that important guests join your conference successfully. You can also use this service if you need to consult with a colleague first, or bring a guest into the conference without them having to worry about codes or phone numbers. The Host Dial Out feature is also handy for guests in remote locations. Do you offer a transcription service? We have standard terms and conditions for all Eureka Teleconferencing customers. You can read our Standard Form of Agreement here. Register a credit card number with us. After you use Eureka, a tax invoice is emailed to the account holder. They will have 14 days to check the invoice after which the amount owing will be deducted from the nominated credit card. Customers with a valid Company Registration Number have the option to pay by cheque or remit on a 14 day account. What charges do I pay if I use a mobile phone to connect into the teleconference? Mobile phone users who call a capital city access number will be charged their normal rate by their mobile carrier. If they call the national toll free number, they may still incur a charge from their carrier depending on their individual plan. Why is Eureka so cheap? We can offer low pricing without compromising our quality due to our investment in reliable, automated, integrated systems. This affords us low operational costs and the ability to manage high volumes of users. It also liberates our customer service team to focus on your conferencing requirements. How much will my teleconference cost me? Our pricing is straightforward and uncomplicated. There is no charge to register and there are no subscriptions or monthly charges. You will only ever be charged for what you use. Click here for pricing or call us on 0800 448 301 for an obligation-free estimate.